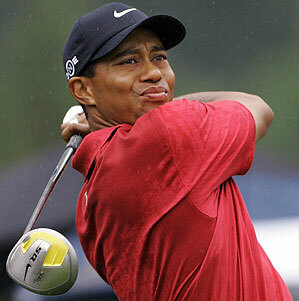 Though Woods has had a terrible run in 2010 followed by the scandal ,divorce and stuff which seriously hampered his form. But by the year ending he had bit of laugh to cheer about where in California he has a four stroke lead in the Chevron World Challenge. He made a perfect six-under par 66 for 13 under 131 to stretch his lead to four strokes, hence challenging U.S Open champion Graeme Mc Dowell. After 2009's Australian Masters he had glimmer of form to show here, though it not being an official PGA Tour event,but still will carry ranking points. Here Woods have a chance to re-claim world number 1 spot temporarily from Lee Westwood. He played an amazing par-fives, with an eagle on the second go. Mc Dowell was also catching hard on Woods with 69 for 135, while Northern Ireland star Rory Mcllroy is at 70.Mc Dowell double bogeyed the final hole to fall back into a tie with Luke Donald from England, who shoot the leaderboard to 66. He has been playing for six straight weeks, but there were no sign on tiredness and kept on challenging Woods big time. Apart from the leaders, two shots were noteworthy here.England's Paul Casey made a hole-in-one at the 188 yard 12th, while American Bubba Watson holed his second shot at par-five 16th for rare thee-under albatross. On the other hand Westwood had no intentions of giving up his new status as he marched past the Nedbank Challenge in South Africa by five shots after three rounds.He carried one-under 71 on the Gary Player Country Club course at Sun City for a 13-under with a total of 203. Ross Fisher from England and Tom Clark are tied in the second at eight-under.